This is the first game in the Metroid series. For other games in the series see the Metroid category. 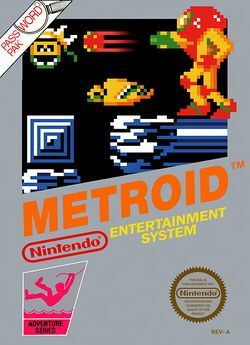 Metroid is the first game in the Metroid series of video games. It was released first for the Famicom Disk System on August 6, 1986, and later for the Nintendo Entertainment System in August 1987 (North America) and on January 15, 1988 (Europe). It was the thirteenth best selling Famicom game released in 1986, selling approximately 1,040,000 copies in its lifetime. The game was produced by one of Nintendo's most prolific game and hardware designers, Gunpei Yokoi, and was directed by Yoshio Sakamoto. The game's music was composed by Hirokazu "Hip" Tanaka. Metroid provided one of the first highly nonlinear game experiences on a home console. The basic gameplay is a mix of action adventure and platform shooter. The player controls Samus Aran across sprite-rendered two dimensional landscapes, starting with only a weak blaster shot and jumping ability, preventing progress to certain areas of the game world. As the player explores more of the area, they will encounter power-ups that can be used to pass the previously encountered obstacles, allowing them to explore further and find more power-ups. In addition to common enemies that inhabit the world, Samus will encounter bosses that she will need to defeat before progressing further. The original Metroid is present as an unlockable bonus in the Nintendo GameCube game Metroid Prime. In 2004, Nintendo released Metroid: Zero Mission for the Game Boy Advance, a modern "re-imagining" of the original Metroid which also includes the emulated NES game as an unlockable bonus. Also in 2004, Nintendo re-released the original Metroid for Game Boy Advance as part of the Classic NES Series. Nintendo released Metroid for Wii Virtual Console on July 20, 2007 in Europe and on August 13, 2007 in North America. Metroid was in the Top 20 Most Popular Downloads on the American Virtual Console until October 30, 2007, and was the Number 1 download from August 18 to August 21, 2007, displaced by Super Metroid. Currently, Metroid is available off the Nintendo 3DS eShop. In the year 2003 C.C. (Cosmic Calendar), the leaders of various planets united in order to form a congress that became known as the Galactic Federation in an attempt to construct a fair and structured universe that would enable society to grow and prosper. Under the guidance of this new federation, the individuals of the planets began to associate with each other, and a new civilization began to develop. Various leaps in technology for transportation were created, such as interstellar spaceships, and society flourished through the use of such expansion. Note: According to the Metroid and Metroid II: Return of Samus manuals, the year of the Galactic Federation formation was the year 2000. In Metroid: Zero Mission's manual, the year of the Galactic Federation formation was 2003, retconning what was stated in the Metroid and Metroid II manuals. At this time, Earth came into contact with individuals from these other worlds, and the advanced technology that these people possessed was shared with the humans of Earth. All seemed well in this new society. However, devious groups known as "Space Pirates" began to attack the spaceships in the hopes of looting valuable goods, striking fear in the hearts of the people. In order to counter these attacks, the Federal Bureau set up a new combat force known as the Federal Police. Yet the pirates were extremely difficult to battle in the depths of space, even with the advanced technology of the Federation. Thus, they recruited a group of courageous individuals who became known as "Space Hunters", equipped with the best weapons available. The Federation provided huge financial bonuses to the Hunters in reward for hunting down and destroying the pirates. It is now the year 20X5 C.C., and the universe has continued to develop while battles still rage throughout space. Recently, reports have indicated that a spaceship is traveling with a capsule containing an unknown life-force from the deserted planet of SR388. This planet has been attacked and seized by the Space Pirates. While research about this life-form, currently in hibernation, is incomplete, it is known that exposure to beta rays for 24-hours will cause it to multiply. Some scientists believe that this life-form may have been the cause of destruction of life on SR388. Scientists decide to call this being a "Metroid" and the mere thought of it being in the hands of pirates is utterly disturbing. If the pirates learn how to multiply it and use it as a biological weapon, the cost of lives could be overwhelming. The Federation launched search teams to find the pirates and were fortunate to discover that their base was located deep within the planet Zebes. However, none of the forces are strong enough to take the pirates down. During this outside battle, operations to multiply the Metroid within the Space Pirates' headquarters were soon becoming a reality. Desperate for a solution, the federation decided that the only option left was to attempt to infiltrate Zebes and destroy the leader of the Space Pirates, "Mother Brain." To make matters difficult, the structure of the planet Zebes is a natural fortress that consists of a large maze. Scattered throughout the maze are various traps and allies of the Space Pirates. This mission clearly requires a special individual to complete, and so the federation has selected the most dominating Space Hunter of the entire organization. This space bounty hunter is known as "Samus Aran." Samus, though human, has a cybernetic suit, thus providing her with an uncanny amount of power. She has, to this date, completed many missions considered impossible, and her suit has the power to withstand lethal attacks, while providing many itself. Samus makes her way through the fortress-planet Zebes, collecting weapon and health upgrades, advancing to new areas, defeating Kraid, Ridley, and Mother Brain, and, in the end, destroys all Metroids on Zebes. This page was last edited on 10 February 2016, at 03:45. This page has been accessed 300,723 times.